Tags: ADA, Autumn, challenges, community, disabilities, Education, Randy. Randy and Autumn trek through the airport on their way to their first plane trip together! 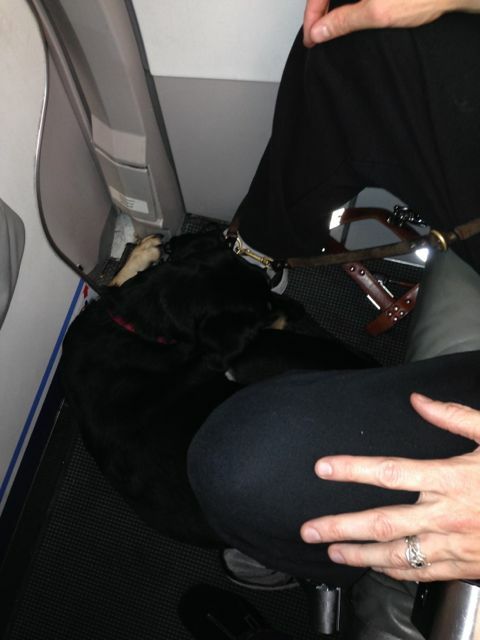 As Autumn and I stroll through the airport and onto the plane, and then settle into a seat with her curled up against my feet on the floor in front of me, it may seem a simple process. For Guiding Eyes Autumn, December 4 was her debut flight and we thought we’d enlighten the many who have asked how the entire process works. Like most things, it begins with planning and preparation. Thankfully the A.D.A. (American’s With Disabilities Act) ensures she is welcome to accompany me on a flight and not require any additional cost or ticket purchase. Guiding Eyes for the Blind has ensured that we as a team are trained for our part in the responsibilities involved. She has proven able to exceed the behavioral needs despite all the possible surprises which might arrive on a flight. I’ve been trained to ensure the ability to keep her within those expectations and properly educate the people around us through the process. Depending on the length of flight and possibilities for relieving Autumn, I’ve adjusted her schedule of food and water to ensure she can fly comfortably without risk of an accident nor of insufficient nutrition and hydration. This is more difficult with the extended security approaches, although many airports have very kindly provided relieving stations beyond security. I have food ready for her immediately after we finish our flights. Alerting the airlines 24 hours in advance is a courtesy which can also allow me to request bulkhead seating for us. On many airlines this has just a little more leg room which aids my 6’4” frame and her 65 lbs of Labrador to cohabitate a little better. This time we are traveling with Tracy and may negotiate a little of her leg room too. Autumn settles in at Randy’s feet, ready for the long flight. On the day of the flight, we’ll arrive a little early and ensure her a final relief before braving the security process. They will usually expedite us through security and thereby ensure a Dog Guide trained scanner as well. She sits in a stay while I walk through the scanner (hopefully successfully though the blind guy not touching the sides is another interesting challenge). Then while they watch I call her through and typically the harness will set off the alarm so they’ll pat her down. Often this is a treat for Autumn and the scanning agent. We then resume to the gate and request early boarding to ease things a little more. Sitting in plain view of the gate reminds them we are there to help finalize that early boarding. Sometimes a little interaction with a fellow flyer in our row helps build comforts though there’s an occasional flight with someone unhappy to share the row with a dog guide. The airline may move that person if it’s possible and most of the time soulful puppy eyes win over travelers. We are allowed in any seat not designated as the emergency exit row. The airline may invite us to move for better comfort and if safety is involved they may direct us to do so, but in my 14 years of flying with a Dog Guide this has never yet happened. A blanket and chew toy complete the options for her comfort especially on her first flight. Eventually she may prove to be as stoic and relaxed as the Mighty Quinn or Ostend before her, but setting the trip for success in advance is key. The final part of that is to ensure her dog food made the trip as it may be harder to find across the country. Just to be safe, a full day’s supply is in my carry-on and her collapsible bowl is on her harness. Now we are off and ready for new adventures together! Tags: ADA, disabilities, Education, Quinn, Randy. Dogs and cats, monkeys and rats, snakes and spiders, and many more were flocking to public places like a legendary ark. People want to know what a “service animal” is. 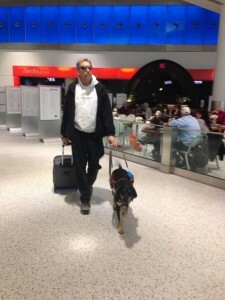 What is the legal right of the “pseudo-service animal’ in the USA? As a guide dog and guide dog owner, Quinn and I have protected access to almost all public accommodations, thanks to the ADA. What many people do not realize is that the ADA has changed the definition of a service animal effective this month. Previously, any animal could allegedly be trained for service, and the nature of the service provided was vastly undefined. As with most rules, people began to provide a broad array of interpretations and sadly, abuses began. This made things difficult for many business owners and tarnished the hard-earned reputation of legitimate service animals. To protect those business owners and to prevent the erosion of the public trust, the ADA has released new rules and definitions that take effect on March 15, 2011. They have allowed only dogs as service animals, which is a major and significant change, though they have suggested that the miniature horse (dog-sized) should receive reasonable consideration. This change comes with some benefit and sadly some detriment, though the real question is, does it accomplish the goal of ending abuses? A person handling a service animal must have a disability listed on the ADA website, and while that list may grow, it is far more restrictive than the purposes for which they are claimed. As such, the first question of protection for the public is, “Do you have a disability?” It is of significance that the type of disability may not be requested. The second and final question is “What task is the animal trained to perform for you?” This means that an animal must specifically perform an action that aids in that disability. The ‘emotional comfort’ claims, which represent a large portion of fraudulent claims, would not fit into this definition without a little more rule twisting. It saddens me that extensive fines (up to $55,000.00) exist for places denying access to those with disabilities, yet no punitive measures exist for those propagating a fraud. A bogus Service Animal Registry website exists online today, and continues to ‘sell’ alleged legitimacy. Mock Service Animal vests and harness systems are similarly available for purchase and yet there is no punishment for the sale or use of these. It will be difficult to bring benefit from any change, and this fails to discourage attempts at abuse. Fortunately, any animal that is behaving inappropriately may be requested to leave, so long as this behavior is handled consistently for anyone, human or canine, who is performing it. I absolutely wish anyone with a legitimate need and benefit from a service animal could have access to that service in the best means possible. I would hope that all such situations require an animal trained to behavioral minimums and require very reasonable consideration of public impact. A Seeing Eye elephant or even Irish wolfhound would have a size impact that seems ridiculous, especially since a ‘curl under my chair’-sized retriever can perform the same function. This is not to say that I believe only a dog is acceptable as a guide, or even that only that size frame can be considered. The challenge is finding something reasonable in a world where too many people are not looking at those terms but rather their own preferences first. I have encountered many frauds and even have friends who seek to break the rules for their own purposes. I know there are needs more diverse than I could possibly evaluate, and I appreciate the incredible benefit Quinn brings to my world. I advocate on a regular basis for all sides and perspectives, to give very serious and reasonable consideration to all choices and impacts of those choices. I hope some of you may give some serious consideration to and communication on the topic. Education and communication can do much, but action can reduce or prevent deliberate and willful abuse by those who deny service that is required or those who deliberately attempt to fool the system. 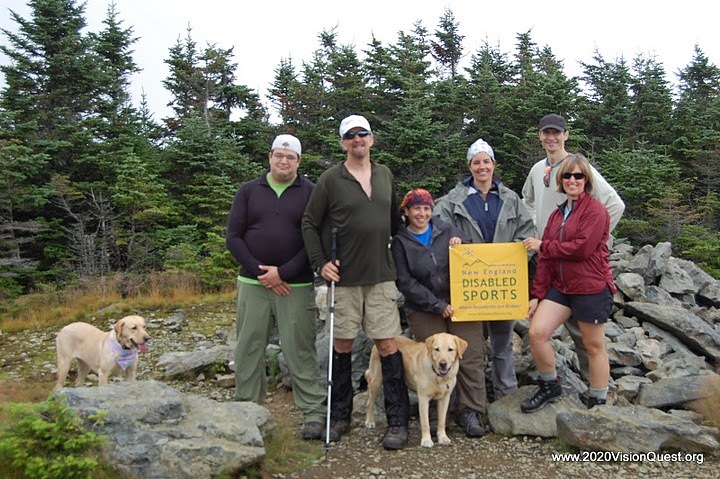 Tags: ADA, blind hiker, disabilities, Randy, Support.